Brocade enables an on-demand service delivery model and extends application delivery service as an elastic Network Functions Virtualization (NFV) component through the Brocade Virtual ADX. This solution features a distributed architecture with a dedicated, logical management processor and multiple logical application cores to enable intelligent traffic management at scale. The Brocade Virtual ADX offers robust Layer 4 – 7 services with high availability and comprehensive management and orchestration. We live in a fast-paced user-oriented world, driven by the proliferation of mobile computing, cloud-based services, social networking, and Big Data analytics. As the cloud has become the central delivery and platform for applications, we are conditioned to want services to be accessible whenever and wherever, in an on-demand, self-service manner. User experience depends on the speed in which an application is available, delivered, and accessed; therefore, business survival depends on application performance. As service providers and enterprises grow more reliant on cloud-based environments, virtualization becomes increasingly critical to meeting their modern business requirements. However, virtualization alone is not enough because most networks are still built on outdated, static equipment. Brocade enables a dynamic service delivery model and extends the reach of Network Functions Virtualization (NFV) through the Brocade Virtual ADX Application Delivery Switch. This frees organizations from traditional networking obsolescence and allows them to deploy a more agile, flexible, and resilient application delivery networks. The Brocade Virtual ADX is an application delivery switch with a virtual footprint that provides comprehensive Layer 4–7 network feature sets in a simplified form factor for on-demand data center environments looking to deploy application traffic management and deliver ADC as a service. Specifically, the Brocade Virtual ADX runs on standards-based hypervisors, hosted on an x86 Commercial Off The Shelf (COTS) system. As a virtual form factor, the Brocade Virtual ADX provides the core application delivery switch value proposition into cloud architectures and remains the key to preventing downtime and maintaining application availability. 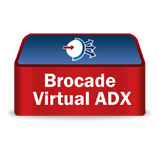 The Brocade Virtual ADX instance can be provisioned and ready for inclusion in the production pool faster than a physical ADC appliance. Application delivery services can now be configured, deployed, and moved dynamically with the agility of software. Through the Brocade OpenScript engine, network operators can flexibly build advanced policies and custom services in real time with the powerful and sophisticated Perl-based application scripting engine. The Brocade Virtual ADX simplifies the administration and orchestration of the application delivery tier, an integral part of the overall cloud ecosystem. The system Web GUI is enriched with XML APIs to provide real-time system monitoring, versatile system configuration templates, and application scripting development tools. The Brocade Virtual ADX is also available as an OpenStack plugin, offering easy management through OpenStack Horizon as well as automation via the OpenStack Heat template. The Brocade Virtual ADX enables comprehensive application delivery controller (ADC) functions to be deployed on a standardized COTS server, thereby relieving the CapEx burden of purchasing dedicated appliances. For service providers, to align with their recurring service revenue stream model, the Brocade Virtual ADX can be procured using the flexible pay-as-you-go utility payment model. With automated orchestration and simplified provisioning on standards-based hypervisors, organizations can now quickly add, move, and change critical application delivery services. The Brocade vADX operates seamlessly under the Brocade Vyatta Controller. This controller is a quality-assured edition of the OpenDaylight controller code supported by an established networking provider and its leaders within the OpenDaylight community.